Please contact us for an RMA number. NO RETURNS WILL BE ACCEPTED WITHOUT A RMA NUMBER. At M.R. Boots, we strive to exceed your expectations. However, if for any reason you are not entirely satisfied with your purchase, you may return it within 30 days of receiving it for a full refund on the total cost of your purchase less the cost of shipping. There are no refunds on shipping charges or return shipping charges unless there is damage due to a manufacturer's defect or we have shipped to you the wrong item. All items must be returned promptly in new, unused, unlaundered, resale condition within 30 days of the date that it was shipped. If your return is older than 30 days you will be assessed a 20% restocking charge. If YOUR return older than 45 days it will not be accepted, it will be returned to you at your expense and no refund will be processed. All items must be returned to us in the original box supplied by the manufacturer. The box must be in new, unused, un-marked, resale condition. Any items that are returned and do not meet this criteria will not be accepted and no refund will be processed. Jewelry: Jewelry that has been used or worn cannot be returned. No refund will be issued on Jewelry items. If the Jewelry item is damaged due to a manufacturer's defect we will either repair the item or replace the item with a new identical item. Custom Engraved Buckles CANNOT be returned. No refund will be issued on Custom Engraved Buckles. If the Custom Engraved Buckle is damaged due to a manufacturer's defect we will either repair the item or replace the item with a new identical item. All shoes and dance shoes must be returned in new, unused, unsoiled, resale condition within 30 days of the date that they were shipped. Please note that all shoes and dance shoes are shipped to you in two boxes. The original manufacturer's box that the shoes are packaged in plus a second shipping box. All shoes and dance shoes must be returned to us in the same manner. They must be returned to us in the original manufacturer's box plus a second shipping box. All shoes and dance shoes that are returned and do not meet this criteria will not be accepted, they will be returned to you and no refund will be processed. If the original manufacturer's box that is returned to us is damaged, has writing on it, has shipping labels or stamps on it, then you will be assessed a $5.00 restocking charge. If the shoes and dance shoes are used and are damaged due to a manufacturer's defect, they must be returned within 30 days of the date that they were shipped to you. We will either repair the item or replace the item with a new identical item. We will not issue a refund on shoes or dance shoes that have been worn & used. If they are returned to us after 45 days they will not be accepted, they will be returned to you and no refund will be processed. All boots and dance boots must be returned in new, unused, unsoiled, resale condition within 30 days of the date that they were shipped to you. Please note that all boots and dance boots are shipped to you in two boxes. The original manufacturer's box plus a second shipping box. All boots and dance boots must be returned to us in the same manner. They must be returned to us in the original manufacturer's box plus in a second shipping box. All boots and dance boots that are returned and do not meet this criteria will not be accepted, they will be returned to you and no refund will be processed. If the original manufacturer's box that is returned to us is damaged, has writing on it, has shipping labels or stamps on it, then you will be assessed a $10.00 restocking charge. If the boots and dance boots are used and/or are damaged due to a manufacturer's defect, they must be returned within 30 days of the date that they were shipped to you. We will either repair the item or replace the item with a new identical item. We will not issue a refund on boots or dance boots that have been worn & used. They will be returned to you at your expense and no refund will be issued. If the boots and dance boots are returned to us after 45 days they will not be accepted, they will be returned to you and no refund will be processed. Enclose a copy of the Order Invoice, circle the item that you are returning and include in writing the reason for the return. We will not accept any returned packages sent C.O.D. They will be refused. No refunds on shipping charges or return shipping charges unless there is damage due to a manufacturer's defect or we have shipped to you the wrong item. A Special Order Dance Boot, Special Order Shoe Boot or Special Order Dance Shoe is one that has been manufactured with an optional item in place of a standard item. This would include Special Order Sizes, Widths, Toe Styles, Heel Styles, Heel Heights and Colors. 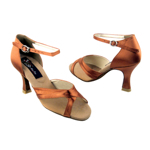 The standard and optional items for each style of the Dance Boots, Shoe Boots and Dance Shoes are listed on their respective Special Order Web Page. PLEASE NOTE: A 25% restocking charge will be assessed to any pair of Evenin' Star SPECIAL Order Boot, SPECIAL Order Shoe Boot or SPECIAL Order Dance Shoe that has been returned. If your return is older than 30 days you may be assessed a additional 20% restocking charge in addition to the 25%. Please note that these items are shipped to you in the original manufacturer's box plus they are wrapped with a protective covering of either heavy kraft shipping paper or plastic shipping wrap, or in a second shipping box. Please note that all Special Order Dance Boots, Special Order Shoe Boots and Special Order Dance Shoes are shipped to you in two boxes. The original manufacturer's box that the shoes are packaged in plus a second shipping box. All Special Order Dance Boots, Special Order Shoe Boots and Special Order Dance Shoes must be returned to us in the same manner. They must be returned to us in the original manufacturer's box plus a second shipping box. All Special Order Dance Boots, Special Order Shoe Boots and Special Order Dance Shoes that are returned and do not meet this criteria will not be accepted, they will be returned to you and no refund will be processed. If the Special Order Dance Boots, Special Order Shoe Boots or Special Order Dance Shoes are used and/or are damaged due to a manufacturer's defect, they must be returned within 45 days of the date that they were shipped to you. We will either repair the item or replace the item with a new identical item. No refunds on shipping charges or return shipping charges.